Joest Racing For The LMS With An R10? The Audi R10 diesel project has gradually ‘filled out’ since the launch of the car in Paris, in mid December. At that stage, there was no official communication regarding the drivers (except that Tom Kristensen would race it) – and no confirmation of anything other than Sebring and Le Mans this year. Nearly three months later, and with the car’s race debut less than two weeks away, we know that the R10s will race at Sebring, Le Mans and in the ALMS events from Salt Lake City in mid-July onwards. R8s will fill in at Houston, Mid-Ohio and Lime Rock. But now we have a very clear indication that an R10 will be seen in the Le Mans Series this year – run by Joest Racing. Reinhold Joest’s team is looking after the test and development programme for the new prototype, and the team will “concentrate solely on the AUDI AG sportscar programme with the new Audi R10”. That means no DTM programme for Joest Racing this year. 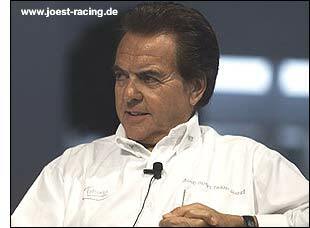 So no DTM opens the way for Joest Racing to compete in the Le Mans Series. Another part of the puzzle is explained by the fact that (according to the excellent www.joest-racing.de website) ‘the R10 race programme in America will be assumed by an American team because the logistical expense to commute permanently between Germany and the USA would be too high’. That American team is Dave Maraj’s Champion Racing, of course. Sticking to form, there has been no announcement yet regarding R10 drivers in anything other than the headline Sebring and Le Mans races. The partnerships in Florida and France will be Allan McNish / Tom Kristensen / Rinaldo Capello and Marco Werner / Frank Biela / Emanuele Pirro – but presumably driver choices for the rest of the season will be worked out according to points scored at Sebring, driver availability (those nominated for the DTM) and date clashes between the Le Mans Series and the American Le Series. The Spa and Houston races effectively clash on May 14 / May 12, as do the Nurburgring and Salt Lake City (July 16 / July 15). We believe that at least some of the likely drivers aren’t yet sure of their exact racing commitments for 2006 yet. Encouragingly, Reinhold Joest is happy to state that "it’s no secret that my heart lies in sportscars,” and "we would really like to compete with the new Audi R10 in the Le Mans Series in Europe. We hope that this project comes to fruition because the European fans will have the opportunity to see the Audi R10 a little more often." Perhaps the Champion connection will see JJ Lehto race in the ALMS – or is that fanciful thinking? It’s hard to see the Le Mans Series organisers turning away an Audi R10 entry at Donington Park in August – even though the entry for that race seems to be over-subscribed already. The most likely scenario would appear to be the entry of one Audi R10 in the LMS races at the Nurburgring (July 16), Donington Park (August 27) and Monza (September 24). The R8 made its European (series) debut at the Nurburgring in July 2000 (it had already been victorious at Le Mans), but was beaten by both Panoz and BMW, in an incident-packed wet race.